WatchBuys, an online retailer that specializes in German watches, stopped by San Francisco for a road show to show off some of the watches it carries. Some of the brands represented at the show included Nomos, Hanhart, Bruno Sohnle and Sinn. I’ll be honest and say I was most excited for a chance to try on the beautiful watches from Nomos. I’ve lusted after Nomos as a brand since I started my watch collecting hobby. From the Bauhaus design to its wonderfully “reduced” sizes, Nomos caught my eye like no other brand. However, once I arrived at the show, I found myself blown away not by Nomos but by Sinn. For the uninitiated, Sinn is a German watch company founded in 1961 and is based in Frankfurt, Germany. Sinn made cases for companies like Heuer back in the day, and still provides cases for other watchmakers. The first Bell & Ross watches were basically rebranded Sinn watches. The company is mainly known for its pilot watches but its collection offers so many different styles, from professional divers to dress watches. 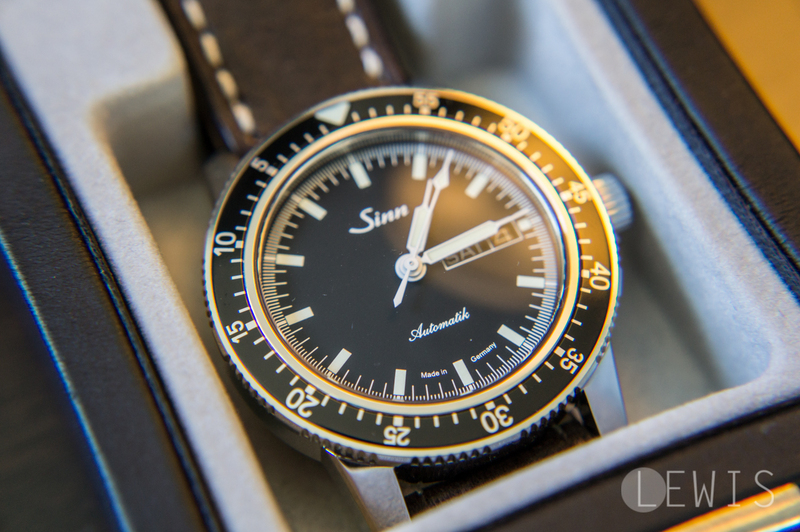 Some of Sinn’s cases use tegimented steel and has an iconic matte finish. Tegiment is a technology that increases the hardness of a base material, like steel, via a chemical process. The result is a super scratch resistant surface that’s much harder than raw stainless steel. Beyond the case material and finishing, I found myself drawn to the understated designs and how unabashedly utilitarian Sinn’s watches are. I classify Sinn as a “tool watch” manufacturer because every one of its timepieces serves a purpose. Legibility, durability and affordability are imbued throughout the Sinn collection. I also love how understated its designs are. The watch that I fell in love with at the road show was the Sinn 104 St Sa I. At first I thought it was a diver with its bezel and 200 meter water resistance but its actually a pilot watch since it has a bi-directional bezel. You want a uni-directional bezel if you’re timing your oxygen supply while scuba diving. Either way, the Sinn 104 is simply gorgeous and can be dressed up or down. Its polished case is not flashy and it would look great on either a bracelet or leather strap. In my opinion, Sinn is the new Rolex, in that the company is creating tool watches that the working man can afford. Rolex, with its Explorer, Submariner and Milgauss, used to be the go-to brand for tool watches but as the company moved upmarket, so did its prices. To be fair, Rolex has done a great job reviving its Tudor brand to give consumers relatively affordable tool watches like the Pelagos. Sinn, on the other hand, has remained obtainable to those who don’t make six figures. Sure, its watches are still expensive but you get a lot for your money when compared to other watch brands. I want to thank WatchBuys and its staff for throwing together a great show and geeking out with us watch idiot savants about German watches. And thanks to Worn & Wound for alerting me to the existence of the road show!